Anti-oxidation is always linked to anti-aging. With anti-aging effects, we are actually reversing the biological clock and locking ourselves in a youthful appearance. The following test demonstrates the anti-oxidation ability of HKIII Bamboo Salt. 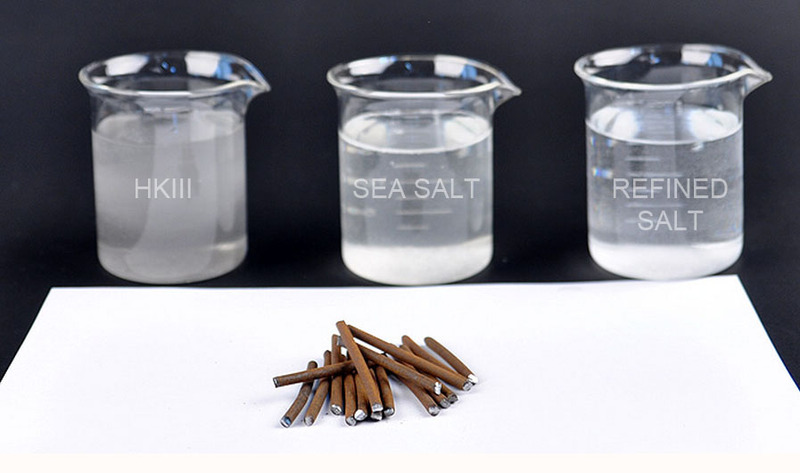 1) 20g of HKIII Bamboo Salt, sea salt and refined salt are put into each beaker respectively. 2) 200ml of water is added into each beaker making up 10% concentration of each solution. 3) The rusted nails are prepared. 4) The rusted nails are put into each solution. The rusted nails is a result of oxidation. Similar to aging, it is also a process of oxidation. Human cells is damaged by every day free radicals through oxidative reaction. We highly recommend you to consume 1-10g of HKIII Bamboo Salt daily to revitalize your cells to keep you look young and healthy!